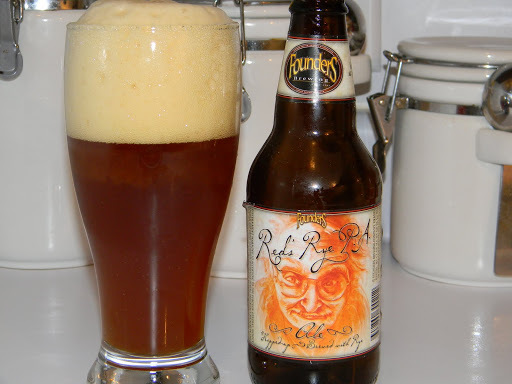 Review of Founders Red’s Rye Pale Ale | Beer Apprentice - Craft Beer News, Reviews, Interviews and Info. For tonight’s review, I want to share with you a beer from one of my all time favorite brewers. Located in Grand Rapids, Michigan, Founders Brewing Company produces some of the highest quality beer on the planet. The drink I have chosen for this evening is the Red’s Rye Pale Ale. From the website, foundersbrewing.com, one can see the lineup of outstanding brews they have available. Here is some info that I found on the Red’s Rye. Every beer that I have tried from Founders has been excellent and I would expect nothing less from this one. This brew has a 6.6% ABV and comes in a 12oz. bottle. It pours a cloudy/hazy, reddish to burnt orange color with dark yellow and gold highlights around the edges. A beautifully thick, creamy head that was mostly white, but had a negligible red tint to it. It supported tremendous girth and retention with some considerable lacing. Nice, fresh, perfumy hops abound in the nose. Fruity tones that fall along the lines of grapefruit citrus and ripe peaches. True to its name, I detected a dry rye bread note that steps through solidly. This thing smells wonderful, although I did not find any of the descriptive caramel. I found no alcohol in the aroma either, which was nice and it let me only concentrate on the “beer” portion. With the flavor I got, of course, the grapefruit citrus along with the re-mindful hop “bite”, however the bitterness is surprisingly tame for a beer that registers 70 IBU’s. It’s there, but it’s not overpowering or overwhelming. The rye suggestion was soft and fitting and is more of a backdrop in the taste, but it’s duly noted. Very nicely balanced with a medium mouthfeel that was dry, crisp, refreshing, clean and delicate. Only the most remote warmth was felt and that is more than ok for this style of brew. This is a very, very nice beer. Similar to other Pale Ale’s, this one could be quaffed with ease during the Spring and Summer. It’s super easy to drink even though it stands at a respectable 6.6% ABV. One thing I noticed as I neared the end of the drink was how the head stayed around for almost the entire setting. Amazing. I love when a beer does that. Now don’t get confused and think this is on par with a revved up Imperial IPA, however I think it does bring out a lot of the same characteristics and adds a nice twist to boot. It’s most definitely worth a try if you see it. Like always, please leave a comment if you have sampled Founders Red’s Rye. I would love to hear from you. Thanks again for reading. I really appreciate it.